Welcome to the website of the New Delhi Aikido Dojo! Established in November’ 2004, our dojo is promoting traditional Aikikai style Aikido in India. The dojo was opened in November 2004, inaugurated by an Aikido demonstration by Mr. K. Sakurai, an Aikikai Hombu Dojo 7th Dan. 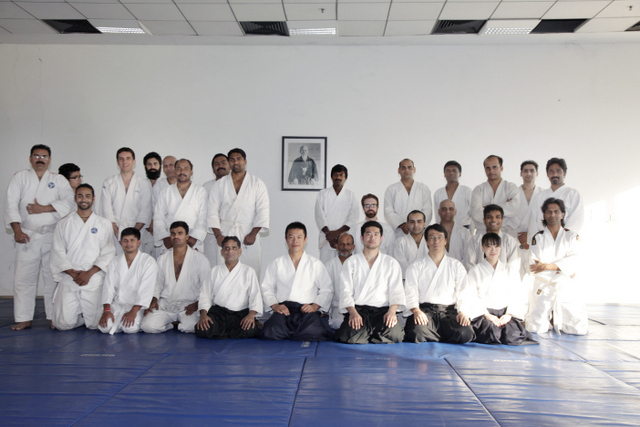 The dojo in New Delhi is one of the most active Aikido schools in India with 12 classes a week. As of the Summer of 2018 there are more than thirty active students. Many of the current students have experience in other martia. At the dojo all kinds of people, men and women, Indian and international students, train together cooperatively. Sensei Paritos Kar, 5th Dan Black Belt, is the founder and chief instructor of this Aikido school. Based on his 10 years of training in the Aikikai Headquarters, Japan, he is presently one of the most experienced Aikido instructors in India. One can join the New Delhi Dojo by completing the admission formalities. The admission form is available at the dojo. For New comers and white belt holders: Rs.2500 per month(payable bimonthly). Admission fee not required. For Visitors: Visitors can practice after paying mat fee of Rs.500 for a day. For personal training: Please contact instructor. Special concessions for underprivileged students and students with disabilities will be considered. Morning – 6:30 to 8:00 (Monday to Saturday).7:00 to 8:30 (Sunday) at 56 Anand Lok,3rd Floor Dojo,Near Gargi and Kamala Nehru College. The syllabus is available at the Dojo. Please contact the Dojo-Cho. In our school there are 5 ranks below black belt. These ranks are called Kyu ranks and count backwards. The first grading is for 5th Kyu and each new promotion brings the student closer to 1st Kyu. Kyu ranks are not distinguished by colour belts. After 1st Kyu, the practitioner moves on to Shodan (1st degree black belt) and on through the Dan ranks. As a general rule, it takes approximately 4 years to reach the rank of black belt. Kyu Grading tests will be conducted by Dojo-Cho, Dan Grading tests will conducted by the Aikikai Hombu Instructor, Japan. Eligibility for testing depends primarily upon accumulation of practice days. It is important to keep in mind that rank promotion does not necessarily translate into ability. The most important accomplishments in aikido or any other martial art are not external assessments of progress, but rather the benefits of your training to yourself. Kyu-grade tests will be administered on the first Sunday of every month. Candidates who want to appear for grading examination should contact the instructor. *Non-members are also welcome to attend the meditation classes. Special classes for office executives can be arranged on request. We also provide private tuition..